When store bought treats aren't good enough, you need Le Dogue! Store bought brands are filled with ingredients that I can't pronounce, let alone understand! Why should I be feeding this to my dog? I shouldn't and neither should you! 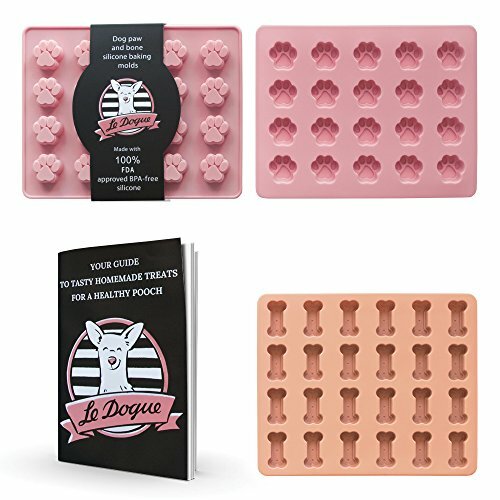 With Le Dogue you can make sure your dog gets the very best by baking their treats with love, at home! Our molds are made of the highest grade silicone, produced to FDA standards and our recipes are not only easy to make but your dog will go crazy for them as well! Whether you prefer Seedy Dog Treaty or Blueberry Bones Forever our dog treat recipes will leave your dog begging for more! Best of allthese recipes are chocked full of healthy ingredients that your dogs should be eating! No other mold set offers you that! Other molds sets only give you 10 or 15 paws or bones per set and don't provide any recipes. Our mold set allows you to make 20 paws and 24 bones at the same time! And we provide the healthiest, easiest and tastiest recipes so that you can get baking in no time! Our family business started when we realized our dog Susie had all sorts of food allergies and store bought treats just weren't good enough for her. So we researched, tested and developed recipes that are based around what your dog should eat and designed our molds to make producing these treats even easier. We have put a lot of time and love into designing our molds and our customers notice our devotion. That is why we are the only dog mold set with a 5 star review average! So what are you waiting for! Click the ADD TO CART button today! DON'T BE FOOLED BY LOW COST ALTERNATIVES! When your pet's health is on the line, get the best! Our FDA approved silicone dog treat molds deliver the quality your dog deserves! UNLIKE OTHER PAW PRINT MOLDS our molds come with a RECIPE BOOKLET! The recipes in our booklet were developed because our dog Susie had allergy problems and we needed a way to make her snacks at home, made out of good, healthy, tasty ingredients! We knew that Susie deserved the best and we know that your dog does too! WHO KNOWS WHAT ARE IN THOSE STORE BOUGHT TREATS, but whether you are using these baking molds to make doggy ice cubes, training treats or paw shaped biscuits, you will know that your dog is eating only the best of ingredients! WE BELIEVE DOGS SHOULD GET THE VERY BEST and that is why we developed our dog treat molds! Our molds are unique, offering more small paws and bones than any other molds and nobody else cares enough to give you a recipe booklet as well. Whether your making bone melts, gelatin candies, dog biscuits or more, make sure you get the best! WE GUARANTEE you will be happy with our silicon molds and if you aren't you can return them anytime during your first year! Just reach out to us through the "contact seller" button and we will do whatever it takes to make you happy! If you have any questions about this product by Le Dogue, contact us by completing and submitting the form below. If you are looking for a specif part number, please include it with your message.